We demonstrate how to perform direct simulation from the posterior distribution of a class of multiple changepoint models where the number of changepoints is unknown. The class of models assumes independence between the posterior distribution of the parameters associated with segments of data between successive changepoints. This approach is based on the use of recursions, and is related to work on product partition models. 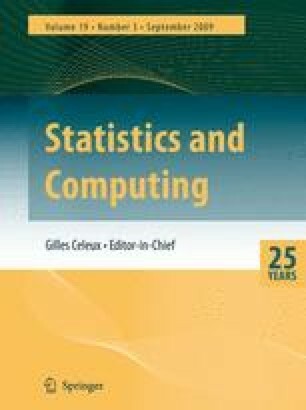 The computational complexity of the approach is quadratic in the number of observations, but an approximate version, which introduces negligible error, and whose computational cost is roughly linear in the number of observations, is also possible. Our approach can be useful, for example within an MCMC algorithm, even when the independence assumptions do not hold. We demonstrate our approach on coal-mining disaster data and on well-log data. Our method can cope with a range of models, and exact simulation from the posterior distribution is possible in a matter of minutes. Fearnhead P. and Liu Z. 2005. Online inference for multiple changepoint problems. Submitted Available from http://www.maths.lancs.ac.uk/~fearnhea/publications.